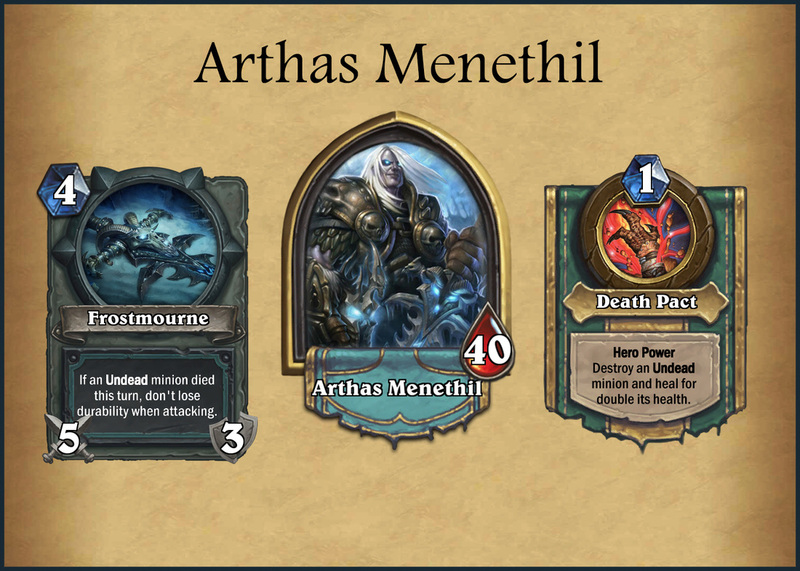 Note: I am not employed by Blizzard Entertainment. 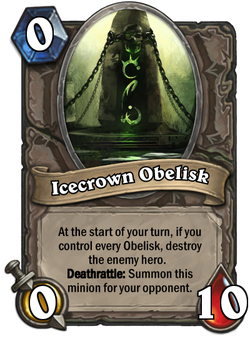 All characters and Intellectual Property belong to Blizzard. This scenario was designed before the release of The Grand Tournament expansion and as a result does not take into account any cards in that or later expansions. 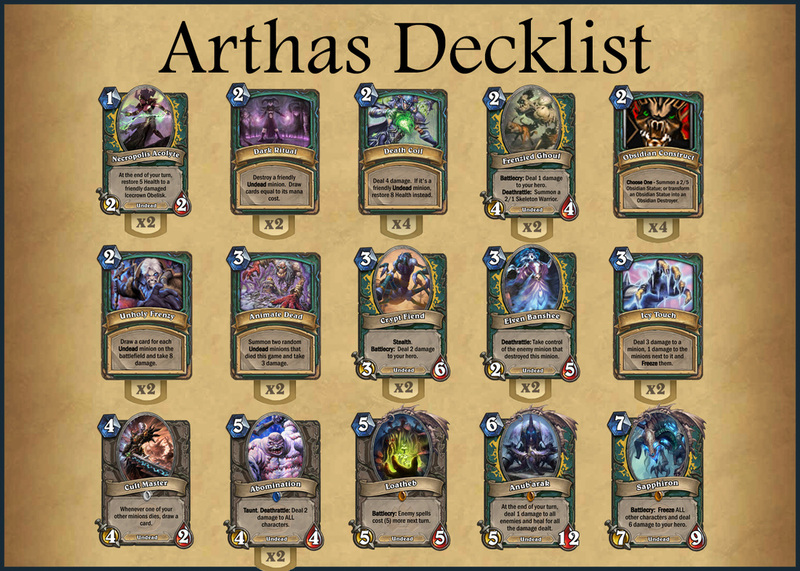 For this project, I wanted to diversify my skill set by designing a new Tavern Brawl scenario for Hearthstone to push my creativity and revise some existing cards to show that I can contribute within Hearthstone's existing framework. 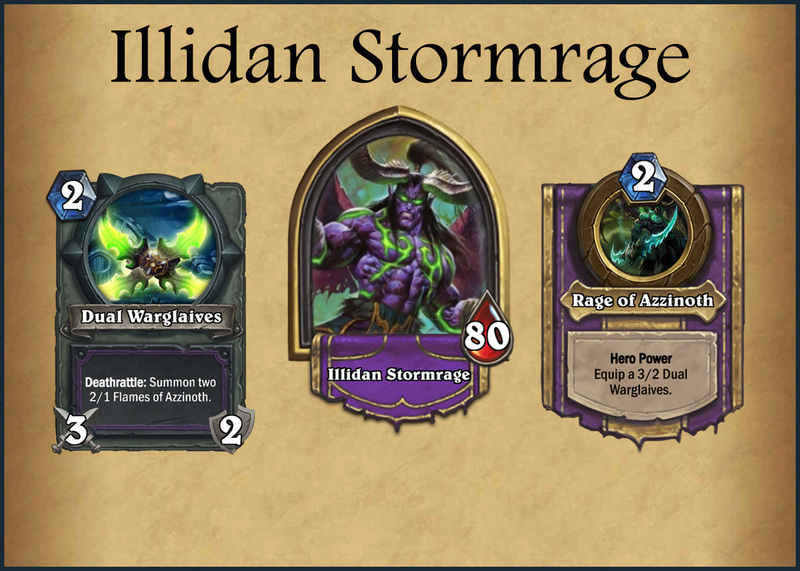 The Tavern Brawl is a grudge match between Illidan and Arthas as they vie over the Frozen Throne. 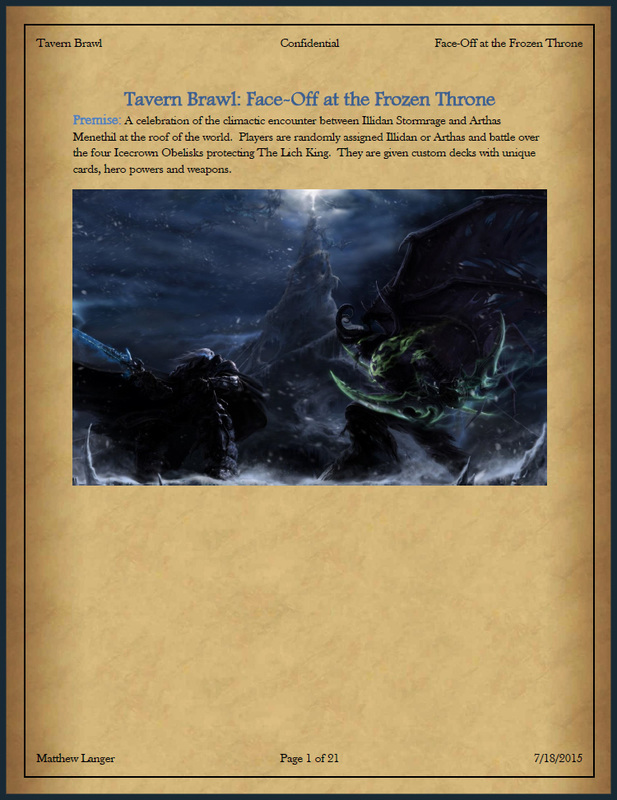 I was inspired by the climactic finale of Warcraft III: The Frozen Throne and one of my most important goals was to incorporate the flavor of that fight into this Tavern Brawl. 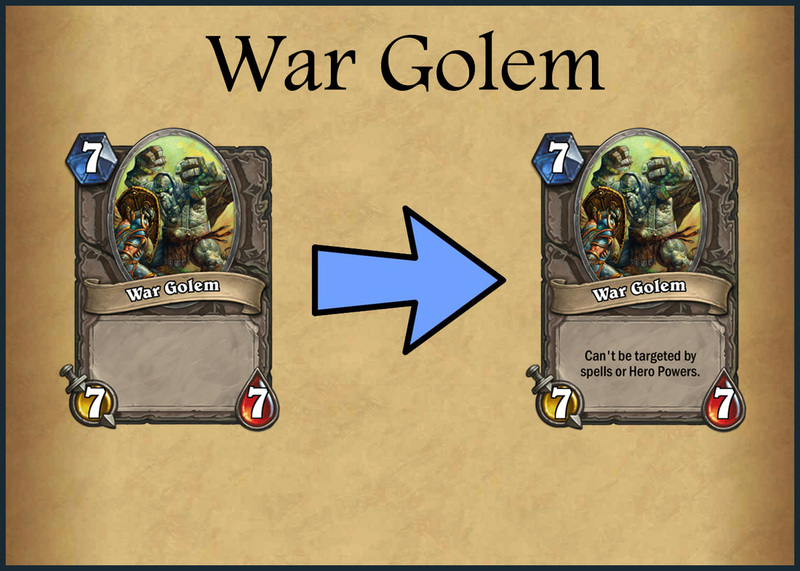 The revised cards bring older cards up to date with new mechanics and address existing card niches. 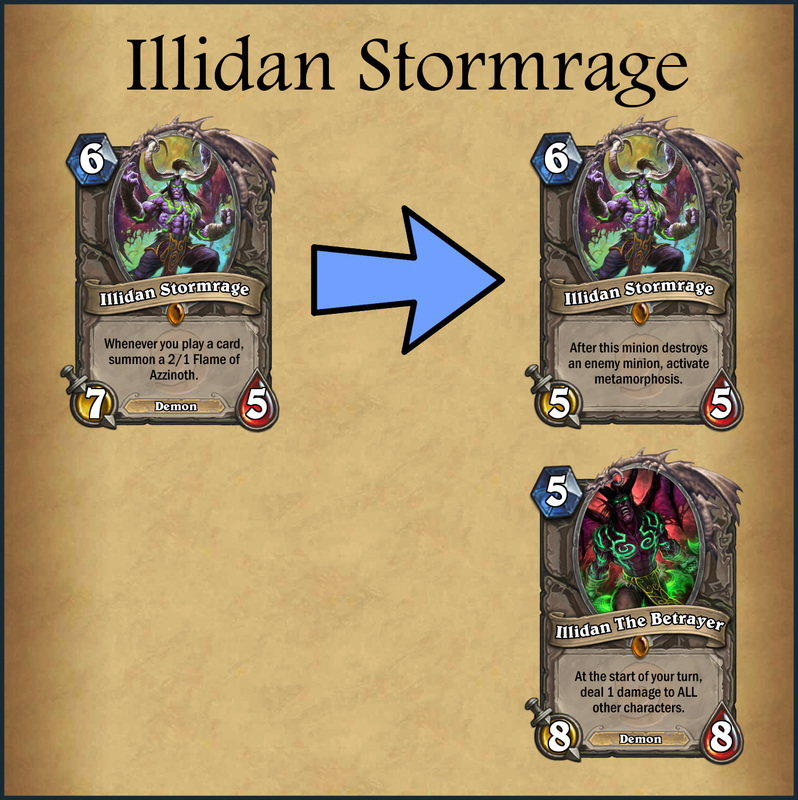 Illidan draws and plays Metamorphosis on turn 8, transforming him into a powerful demon. With the core design completed, the next step was to actually playtest the scenario. 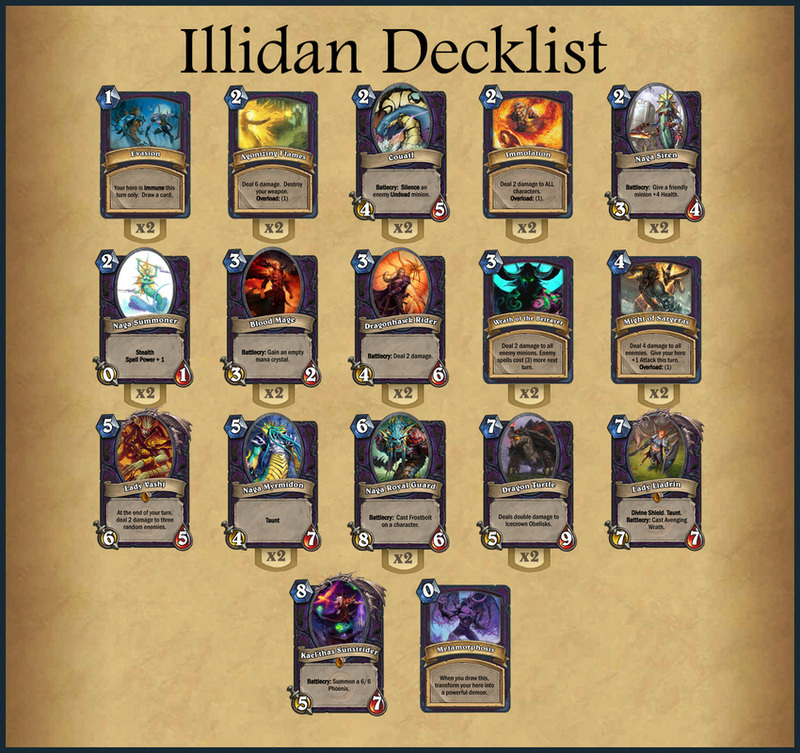 I drew a mock-up of the hearthstone game board and printed out each deck to play. I played the scenario with a friend and adjusted game balance and certain parameters based on the testing. The proposed change still keeps the flavor of a big charge minion, but one that can combo with other cards like unleash the hounds. 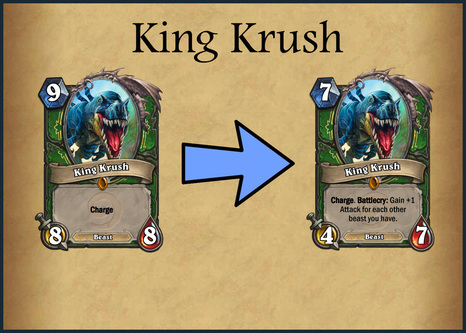 Creates more interesting gameplay by scaling King Krush's attack power with the Hunter's beast count. 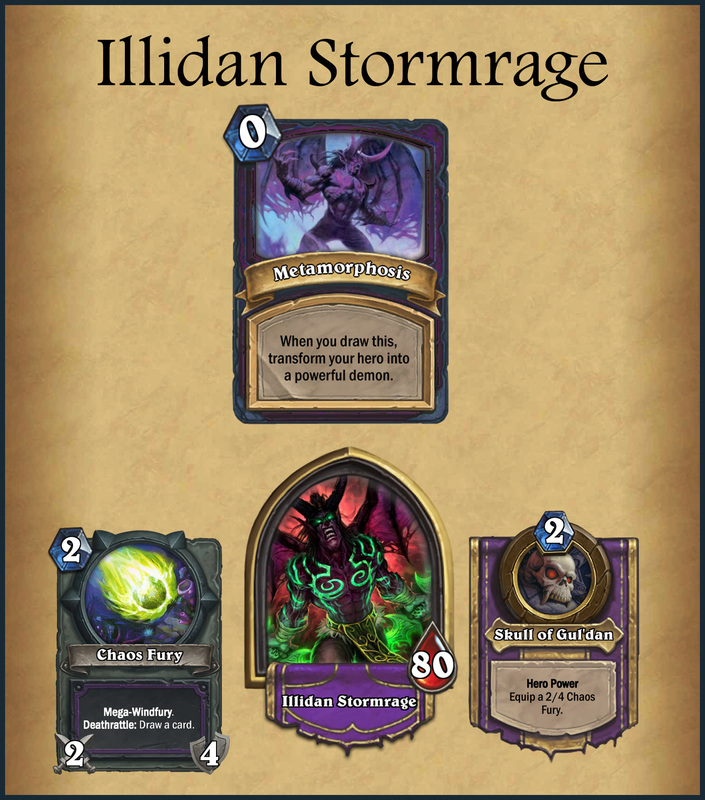 Strong concept: From the start, I thought it would be awesome to have an Illidan vs Arthas showdown and the new tavern brawl mode seemed like the perfect opportunity to explore that idea. Testing the idea: After I finished my first pass on all the cards, I actually played the game several times on paper with a friend to see how the idea actually played out, which helped inform iterations on the idea. 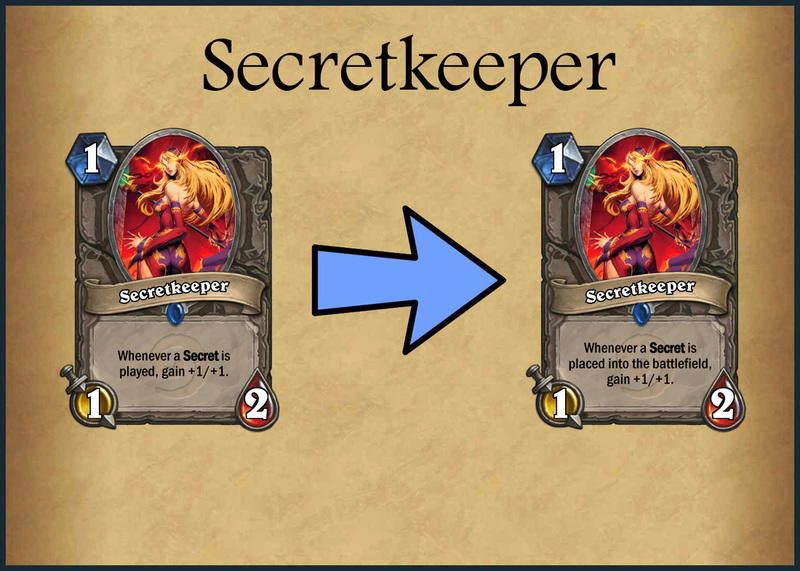 Understanding the game: As a x5 legend player in Hearthstone, I was able to draw upon my depth of knowledge to design a compelling scenario. Getting past the idea phase: Although I effectively brainstormed lots of ideas, I spent too much time on it before I started just ironing out the idea and doing all the Photoshop work needed to complete it. 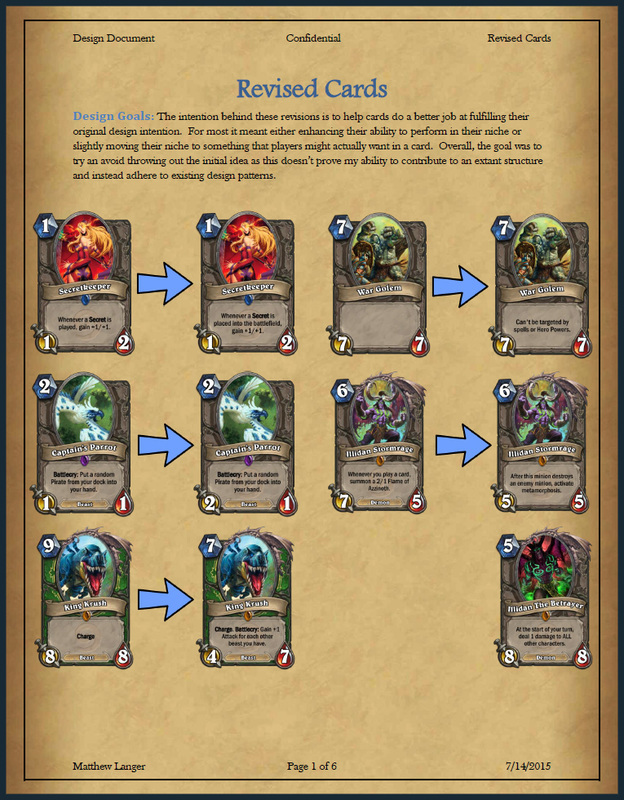 Lack of Focus: Originally, I was going to include a set of new cards for each class, but I dropped that after I realized it was risking muddying the project and taking time from more promising ideas. 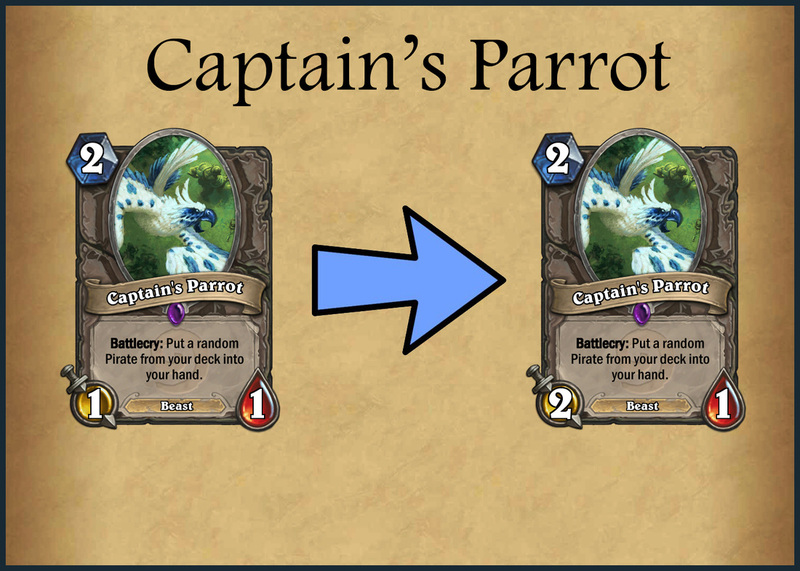 Photoshop Skills: In order to create sample board states of my scenario, I had to improve my Photoshop skills in manipulating existing art. The importance of presentation: As I kept polishing my document, I received increasingly positive feedback from others regarding my idea, reconfirming that the package of the idea can be as important as the idea itself.